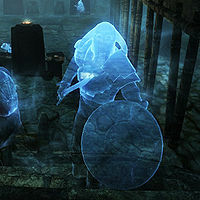 Companion Ghosts are ghosts of ancient Nords buried with Ysgramor in his tomb. They wield a variety of weapons, from bows to swords-and-shields to battleaxes. They will often charge in with a power attack if they have a melee weapon and detect the player at a long enough range. To fight them at close quarters it is best to shield bash, get in a few hits, then move round to the back of them and repeat the process.